Zoukas Alice - Ballas, Pelecanos & Associates L.P.C. 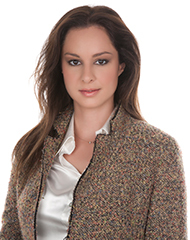 Alice Zoukas is a Junior Associate at “Ballas, Pelecanos & Associates L.P.C.”. She participates in the Company & Employment and in the Corporate Taxation Practice Groups and also assists the Special Sectors Practice Group. Alice is registered with the Athens Bar Association (2010), as well as with the Cyprus Bar Association (2009) and joined the firm in 2011. A graduate of the University College London, Law School (LL.B. Honours), Alice earned her Masters Degree (LL.M. Honours) from the Free University of Berlin in Public Law with specialisation in Tax Law. She also holds a Postgraduate Diploma in Taxation from the Athens University of Economics and Business. Alice is also a graduate of the Department of Political Sciences and Public Administration of the Athens University. At "Ballas, Pelecanos & Associates L.P.C. ", Alice specializes in corporate law, taxation and litigation. She advises the firm’s clients and litigates on all aspects of tax, finance and company law. She advises domestic and multinational corporations on administrative (tax, customs) law issues and court procedure and negotiates with tax and customs authorities within both out–of–court and judicial settlements. Alice has experience in general corporate practice, advising a large number of multinational companies on establishment and ongoing corporate matters. Alice is acting as legal counsel to the Greek Minister of Tourism on matters of public law.